Gathering four stories from four bestselling author friends, Invitation is the first collection in the ongoing Harbingers series. In "The Call" by Bill Myers, four strangers are drawn together to help a student at the mysterious Institute for Advanced Psychic Studies. His gifts are supposedly being honed to assist world leaders . . . but there are some very disturbing strings attached. Frank Peretti's "The Haunted" confronts a supernatural mystery, a case of murder, and an exploration into the darkness of the human heart, all centering around a mysterious house. In Angela Hunt's "The Sentinels," animals around the world are mysteriously dying. What could it mean? When the tragedy begins to touch Andi's dreams, she discovers a terrifying theory. "The Girl" by Alton Gansky is a gripping tale of a young barefoot girl found holding a scroll in the snowy Oregon mountains. She is sweet, innocent--apparently not of this world--and something wants to kill her. I was intrigued by the concept of four well-known, talented, and unique authors writing a series of short stories together. In the introduction, the authors explain that the stories were written independently yet joined together with an overarching storyline in a manner similar to a tv series. I have read novels by all four of the authors and their writing styles are quite distinct. I had no idea that they were friends… fun. With the combined creativity of these authors, it is no surprise to me that they came up with such an ingenious concept. I found Invitation to be quite an experience. The story arc is cohesive, flowing naturally from one short story to the next. The reason that it works so well is twofold. First, each author is writing from the point of view (POV) of one character. Each author's personality, creativity, and style shine when you have one character highlighted by one author All good authors can write distinct characters in their novels. This game just took the experience one step further, allowing a more diverse look into a character. Second, just as the characters are given a unique POV, so are the events that occurred in each story. Each authors style and strengths are portrayed, but they play nicely together. Myers is known for pushing past boundaries, bringing the reader into a deeper understanding of the mysteries of God. Myers doesn't disappoint in The Call. He quickly amps up the intrigue and delves you into a supernatural and mysterious view of the world. The action moved so quickly yet I found it to be entirely satiating. spiritual nugget - The security field at the Institute for Advanced Psychic Studies attacks the fears of the unfortunate person caught in its field. It is a quasi-mechanical creation that highlights the snares that Satan sets for us. The Call reminded me that we are often ruled by our fears instead of our faith. I believe that anyone familiar with Frank Peretti’s novels understands his particular brand of uniqueness. His stories are always a bit spooky and are imbued with the supernatural. If Stephen King were saved he would likely write books that would appeal to Peretti’s fans. Could there be a better name for his short story? spiritual nugget - This is one scary haunted house! The House required me to look at what I value… who I worship. Angela Hunt has an encouraging style. In many ways, she seems to have a teachers soul. In The Sentinels, courage and strength are discovered by the main characters. Their need for faith is explored. spiritual nugget - Faith is required! Gansky delves further into my favorite character, Tank. Tank doesn’t seem very nuanced until Gansky gets his hands on him. Tank represents the characteristics that I want to have. He is smart in all the important ways, kind, and fully dependent and in love with God. spiritual nugget - God is truth! As a reviewer for Bethany House Bloggers, I received a review copy of this book from Bethany House Publishers in exchange for my honest and unbiased review. My thanks to Bethany House Publishers and the authors. One of the most original minds in supernatural suspense, Bill Myers deftly weaves timeless truths into incredible tales, powerful and thought provoking, his worlds have brought millions of readers not only amazement and entertainment, but also into a deeper encounter with God. Here, new territories are explored. Old assumptions are tested. Comfort zones are stripped away. Characters are pushed past all imaginable limits as readers are drawn along a spine tingling tour that ultimately brings them face to face with the mysteries of God. Frank E. Peretti is one of American Christianity's best-known authors. His novels have sold over 10 million copies, and he is widely credited with reinventing Christian fiction. He and his wife, Barbara, live in the Pacific Northwest. Christy-Award winner Angela Hunt writes for readers who expect the unexpected in novels. With nearly five million copies of her books sold worldwide, she is the best-selling author of more than 140 works ranging from picture books (The Tale of Three Trees) to non-fiction books, to novels. 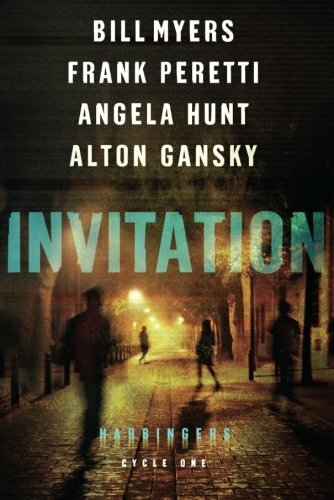 Alton L. Gansky is the author of 24 novels, 5 novellas, 1 screenplay, and 11 nonfiction works, as well as principal writer of 9 novels and 2 nonfiction books. He has been a Christy Award finalist (A Ship Possessed) and an Angel Award winner (Terminal Justice) and recently received the ACFW award for best suspense/thriller for his work on Fallen Angel. He holds a BA and MA in biblical studies and was granted a Litt.D. He lives in central California with his wife.